NSK's Hi-TF bearing steel has recently solved a costly problem at a European cement plant, which was experiencing regular bearing failures on a high temperature fan operating at 150 degrees C. Typically, during an 18- month period, the original split bearings used on the fan would fail at least three times: a failure rate that was considered unacceptable. Examination of the application itself, and of the split bearings, revealed that a combination of high temperature and heavy load was causing the premature failures. As a solution, NSK recommended the use of Hi-TF spherical roller bearings mounted in plummer blocks fitted with labyrinth seals. This combination is capable of continuous operation at 200 degrees C under heavy load. The success of this solution has resulted in a cost savings at the plant of € 9.130 per annum on the operation of the fan. The bearing steel is able to provide this much improved performance as a result of its microstructure, which is able to relax the stress concentrations on the edges of indentations on the bearing surfaces. This microstructure - a material with a high volume of retained austenite and a high hardness - produces a longer life even under conditions where there is an insufficient oil film and surface damage, such as peeling, easily occurs. 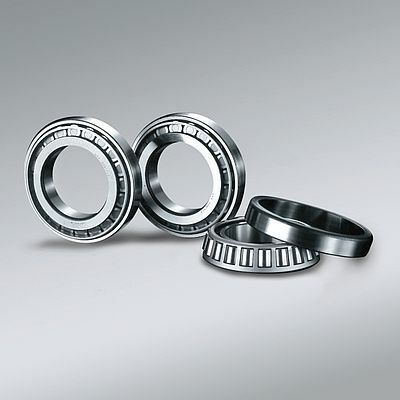 In addition, Hi-TF bearings also offer increased resistance to wear and seizure, as a result of the dispersion of large number of fine carbides and nitrides in the bearing material. In comparative tests with bearings made of conventional materials, such as SUJ2 steel, the Hi- TF material structure has shown less than one third the rate of wear and a 20 percent increase in seizure resistance. The steel has also proven its benefits on a screw pump for conveying slurry at a cement plant in the USA. In this application a large angular contact bearing was experiencing dust contamination. Hygroscopic dust was wearing the raceways and increasing clearance to the point that, to avoid catastrophic failures, the bearings had to be changed prematurely, and on a regular basis. NSK recommended Hi-TF Steel as a solution to this problem, asserting that the material would manage the problem by offering resistance to the contamination. In addition, the new bearings would run quieter and smoother and offer shock load protection. Since installing the new Hi-TF bearings, bearing consumption at the plant has reduced by more than 50 percent. As a result of this success, the plant has since converted other locations to Hi-TF bearings.